Activision announced today that Call of Duty: Modern Warfare Remastered, a complete enhancement of one of the most critically-acclaimed games in history, is available as a standalone release now on PlayStation 4, Xbox One and PC in stores and as digital download on Steam. 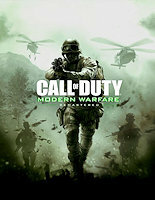 The game includes the full campaign and all the multiplayer maps fans know and love from the original Call of Duty 4: Modern Warfare, all released with stunning high-definition visuals. For more intel about Call of Duty: Modern Warfare Remastered, be sure to visit the official Call of Duty: Modern Warfare Remastered webpage. Prepare for the Wearin’ o’ the Green with Operation: Shamrock & Awe! Gosh and begorrah, soldiers! Starting today in Call of Duty: Modern Warfare Remastered you’ll notice that a lot of green will be popping up in loadouts everywhere. Plus, you won’t need to chase any rainbows in search of treasure because in honor of St. Patrick’s Day we’ve free Supply Drops, a new, free map, two new camos to earn, and loads more heading your way! So that pot of gold we mentioned? It’s actually emerald green, rectangular, and looks like a Supply Drop. That’s right, we’ve got themed Supply Drops throughout Operation: Shamrock & Awe, and we’re making one available for free each week when you log in starting today through 12:01am PST on April 3. Note: Only one free Supply Drop per week, and they don’t stack up, so make sure you check in and download by Sunday at 11:59pm PST every week between now and the end of Operation: Shamrock & Awe or you’ll miss out. Besides being known for its long sightlines, mounted machine guns, and sneaky peripheral routes, Downpour is a map also known for its fierce weather. But a bit of luck has landed on your side as the clouds have parted and shed sunlight on this map. Daybreak is a free map, available only during Operation: Shamrock & Awe, that turns Downpour upside down and replaces it with a lush, green countryside filled with St. Paddy’s décor and a rainbow, naturally. Daybreak also comes with a nice bonus that you won’t have to catch a leprechaun to unlock. Complete the in-game challenges on the map and you can earn two exclusive St. Paddy’s-themed camos for your weapons: the Shamrockin’ “Folium” and the rainbowtized “Prism.” There are different challenges to unlock the camos for each of the weapon classes, but those challenges disappear when Operation: Shamrock & Awe is over. As part of Operation: Shamrock & Awe, three new themed collections will provide you with St. Patrick’s Day theme reticles, camos, calling cards, and emblems. Each set will also include a bounty for completing the set: assemble the “Luck” collection to earn a new character, “Leprechaun” rewards you with a Shillelagh melee weapon, and “Pot o’ Gold” gives you a unique calling card worth fightin’ for. But that’s not all. If you craft or unlock all three themed collections, you’ll also unlock Darren “Graves” Cosgrave as a playable character for the first time ever! That’s right, you can put the master of the Depot right into your loadout. However, he’s available for a limited time as part of Operation: Shamrock & Awe which expires after April 2, so get busy! So jump into Modern Warfare Remastered and test your luck! Operation: Shamrock & Awe runs now through 12:01am PST on April 3. Sláinte! ‘Tis the Season for more incredible Call of Duty: Modern Warfare Remastered content! On 13th December, six additional MP maps are coming to all Modern Warfare Remastered players free of charge, plus the Christmas themed Winter Crash map and two new game modes: Gun Game and Hardpoint. One of the most critically-acclaimed games of all time just got even better. You can watch the December Update Trailer here. Pick up the Legacy Edition or Digital Deluxe Edition of Infinite Warfare and get Call of Duty: Modern Warfare Remastered in the ultimate entertainment package here. Find out more at the Call of Duty Blog! Modern Warfare is no longer a modern shooter, but that’s not necessarily a bad thing. After years of futuristic CoDs, going back to the present day with Call of Duty: Modern Warfare Remastered is a welcome return to combat that makes me feel simultaneously powerful and helpless due to the way it’s both literally and figuratively grounded. Though the sprawling level design and pacing are definitely dated, the core of Modern Warfare’s combat has aged remarkably well, and that foundation keeps its action movie-style campaign and its multiplayer fun even nine years later. However, outside of its impressive face lift it offers only a few additions to make it feel new to returning players. Get ready to suit up once again as Sergeant John “Soap” MacTavish in one of the most critically-acclaimed campaigns of all time with Call of Duty®: Modern Warfare® Remastered, included with special editions of Call of Duty: Infinite Warfare. Relive some of the most beloved missions in Call of Duty history – including Crew Expendable, Shock and Awe, All Ghillied Up, and Mile High Club – all remastered in incredible high definition for a new generation. A new trailer from Call of Duty: Modern Warfare Remastered titled “Crew Expendable” shows off gameplay in the remastered edition of Call of Duty: Modern Warfare that will be packaged with the Legacy, Legacy Pro, and Digital Deluxe editions of Call of Duty: Infinite Warfare. Word is: “Call of Duty®: Modern Warfare®, one of the most critically-acclaimed games of all time, is back and better than ever. Relive one of the most memorable missions from the Modern Warfare campaign in this ‘Crew Expendable’ playthrough.” This FAQ answers a dozen potential questions you might have about this project.